The fatal collisions involving two U.S. Navy destroyers in the Seventh Fleet’s Area of Responsibility this year could have been prevented, the Navy said in a collision report released Wednesday. The Navy released today the 71-page report detailing the events and actions that led to the separate fatal collisions involving the Arleigh Burke-class destroyers USS Fitzgerald (DDG 62) and USS John S. McCain (DDG 56) with commercial vessels. Three U.S. Navy investigations concerning each of these incidents are now complete, the Navy said. The USS Fitzgerald collided with the containership ACX Crystal off the coast of Japan on June 17, resulting in the deaths of seven Navy sailors. 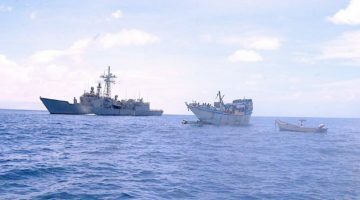 In a separate collision, the USS John S. McCain collided with the tanker Alnic MC after entering the Singapore Strait Traffic Separation Scheme on August 21. The accident resulted in the deaths of 10 Navy sailors. Already as a result of the collisions, the Navy has dismissed a number of high-ranking officers, including the commanders of both destroyers as well as the commander of the Seventh Fleet. The incidents are among a list of four serious accidents involving U.S. Navy surface fleet ships operating in the Seventh Fleet this year. The Navy report said a Coast Guard Marine Casualty Investigation into the Fitzgerald and McCain incidents is also being conducted independently on behalf of the National Transportation Safety Board (NTSB), the results of which will be released by the NTSB when complete. Failure to plan for safety. Failure to properly use available navigation tools. Failure to respond deliberately and effectively when in extremis. Loss of situational awareness in response to mistakes in the operation of the JOHN S MCCAIN’s steering and propulsion system, while in the presence of a high density of maritime traffic. Watchstanders operating the JOHN S MCCAIN’s steering and propulsion systems had insufficient proficiency and knowledge of the systems. The investigation report noted that collisions at sea between U.S. registered vessels and foreign registered vessels are also subject to an additional investigation, a Marine Casualty Investigation, conducted independently on behalf of the National Transportation Safety Board (NTSB) by the United States Coast Guard (USCG). These investigations are ongoing and in each case the results of each will be published by the NTSB when complete, the Navy said.